Highly moisturizing liquid hand and body wash with an essential oil mix of sage, rosemary and lavender that has a calming and relaxing effect. 100% organic and/or ingredients of natural origin. Essential oils from sage, rosemary and lavender is balancing and calming. 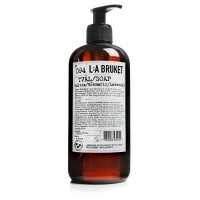 L:A Bruket Sápa - Salvia/Rosmarin/Lavendel 450 ml. L:A Bruket Sápa - Salvia/Rosmarin/Lavendel 250 ml. "L:A Bruket Sápa áfylling -Salvía/Rosmarín/Lavender 1l."